Something's blue and everything's new for fabulous beach ceremonies and fashionable wedding receptions. Great to take on your honeymoon! 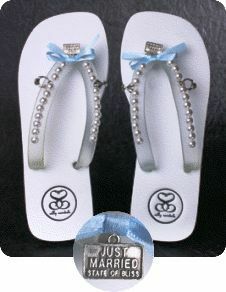 Our lovely wedding flip-flop has accents of pretty pearls and pewter charms of champagne glasses, “Just Married” and an engagement ring...take the plunge in style!